The Mid May 2013 Issue of Practical Welding Letter, Bulletin 85, introducing Resources on Metallography and Microscopy was not distributed by e-mail but it is available at Bulletin 85 and from the Welding Resources Page. This new issue of PWL opens with the news of a veritable revolution in the way that tubes are welded to tubesheet. An International cooperation of nine entities accepted the challenge and set out to deliver a working system, albeit presented as a prototype. Those interested in this kind of productions would do well, probably, to seek updates and follow up on further progress and developments. Mainly young people depend on a smartphone as an inseparable companion. Welding workers and professionals can lately find quick answers to complex question by querying their gadget with suitable apps. A review of a thorough compilation, a guide to available help, is given here. Gas Shielded Flux Cored Filler Metal (FCAW-G) is undergoing continuous progress. An article reporting on recent advancements in the manufacture of new electrodes is reviewed for those interested. More on ASME Section IX: A kind Contributor sent me his clarifying comments on a subject published in the last PWL Issue. If in doubt, Readers may benefit. In the Site Update Section two revised and updated Pages of the Month are introduced, on Electron Beam Welding Tips (R), Electrochemical Machining (R). Basic Metalworking Processes Videos may have direct appeal and be highly instructive: a selection of a few such visual presentations is introduced here, possibly interesting to a larger public. The other sections are published as usual, where they are expected. It is hoped that at least some of the readers will find selected useful information also in the present issue of this publication. Links to the PWL complete list is available from the Index of Past Issues of PWL. The subjects treated in the Mid Month Bulletins are listed in the Welding Resources page. See the second article referred to in section 5 below. The article, however, risks to be read and forgotten. It would be a pity. It announces what seems, in my opinion, nothing less than a Major Revolution in the way tubes can be welded to tube-sheets for manufacturing heat exchangers. The article refers to conventional (manual) TIG-welding as the presently used process. In fact semi automatic TIG orbital welding is already used successfully. Please note that the announced breakthrough was the laborious outcome of an international cooperation involving nine companies and institutions. A consortium of SMEs from Europe, [Small and Medium-size Enterprise Consortium (SMEC)] consisting of companies with complementary expertises, had asked AIMEN (Spain), LABOR (Italy) and IWS-Fraunhofer (Germany) to design and develop an orbital laser welding head for using in tube to sheet applications. The laser prototype described in the article represents a quantum jump in productivity. It is however hard to imagine the gain without collecting and comparing real data. Those who produce heat exchangers and know how long it takes and how much it costs, are in the best position for asking the developers real production data to compare. Then they may wish to consider putting the prototype to work in their environment, to test if it could provide substantial advantages. Readers with practical experience in manufacturing heat exchangers are invited to expose here their comments. Looking for practical data used to be a laborious search of many Handbooks, Tables and Manuals. It was best done in the office, by consulting a rich set of publications tuned to actual job requirements. That is now becoming time consuming, less practical and almost obsolete. With the explosion of smartphone diffusion, huge amounts of information can now be stored in a limited volume and reached instantly, by young and knowledgeable people, whenever they need it. This is done by using a number of Applications, apps for short, realized for solving all sort of problems. A team of editors of the Welding Journal set out to explore which help is available for welders. The results can be found in an Article on Welding Resources, that was published at page 36 in the May 2013 issue of the Welding Journal. It reviews no less than 17 recent Apps available to busy welding professionals who may profit from the convenience of having usable help at their fingertips. A Power Generator Selector may help to find out the size needed. A Calculator from Miller Electric helps to fine tune the Welding Machine parameters according to the job involved. A 3M respirator guide provides information on cartridges and filters for industrial environments. A Pipefitter's Reference on a smart phone may be easier to use than searching through a book of tables. Help is available as a reminder of basic ultrasonic techniques and another one deals with phase arrays. A Lincoln’s app enables exploration of a robot’s in limit, out of limit, and total welds to Check Live Welding Machine Status Reports. A basic app is an easy-to-use Tube/Bar Weight Calculator. Other apps help to find correct parameters for grinding, a ShopFloorTalk (SFT) app by End of Time Studios, LLC, provides discussion forums for users interested in welding and metalworking. A Tool Steel Selection Guide may help in finding the right material for the tool to be made. The ESAB Welding Parameter Setup Guide app offers the lists of recommended settings for GMAW and FCAW. Help with Interpreting Industrial Radiographs in accordance with ASME B31.3 - Process Piping is available to verify one's own interpretation. A further app helps to quickly compare labor, gas, and filler metal costs. Then one can find a Troubleshooter for resistance welding, a series of app calculators for welding, mechanical, and materials engineering, and a Thermal Dynamics Cut Chart designed for the company’s Ultra-Cut series of high-precision automated plasma systems. All in all, it seems quite a complete list of welding help apps that interested readers might check for picking up what is applicable to their own requirements. The article can be found as indicated above. No efforts were done until now to render the pages of this website, www.welding-advisers.com more friendly when viewed by smartphone, as opposed to desktop computer. Maybe this position should be reconsidered, should readers request it. An Article on Gas Shielded Flux Cored Electrodes (FCAW-G) was published at page 30 in the May 2013 issue of the Welding Journal. It reviews and explains fundamental characteristics, of these consumables, that risk to be overlooked in the daily production struggles. Originally they were conceived as an improvement on SMAW electrodes, by putting the covering components in the core, which amounted to turning sticks inside out. This permitted long wires to be supplied to the welding gun from spools. In the beginning only a few sizes were available, intended to cover all requirements and positions. Over the years, more severe requirements were developed for welding higher strength alloy steels, especially with elevated impact requirements at low temperatures. The advantages of switching to FCAW from SMAW included a better operating factor and higher efficiency, both improving productivity. Other FCAW benefits relative to GMAW (Mig) are due to the positive effect of fast freezing slag systems that facilitate out of position welding. Fluxing effects like deoxidizing and controlling base metal surface contaminants, besides alloying additions, are more easily tuned in the flux composition rather than in the steel. 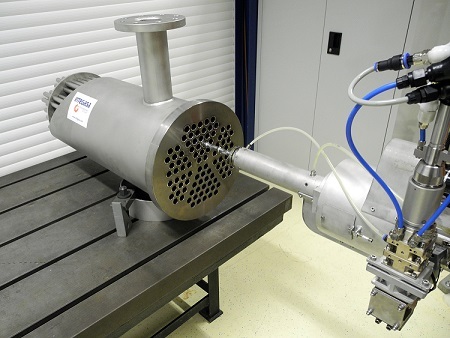 Responsiveness to special industrial requirements was instrumental in the development of new consumables intended to operate best with one or more types of shielding gas. The shielding gases used, either 100% CO2 (carbon dioxide) or a mixture of up to 75% argon and 25% carbon dioxide have different effects both on the arc characteristics and on the final chemical composition of the weld metal. As a consequence also the mechanical properties are affected. Those selecting the gas to be used with a specific application should consult the manufacturer of the FCAW electrode for advice, or test to satisfy requirements. The deposition rate can be higher in flat position than in out of position welding. Improved High Deposition (HD) electrodes were developed with fast freezing slag system to better support molten metal and higher wire feed speed also for out of position welding. In practice manufacturers developed different electrode families to respond to different requirements. It is important that the welding engineer select the right FCAW-G electrode for the applicable requirements. The article concludes summarizing a number of types of electrodes from a specific manufacturer, suggested for given applications. A previous review of another article, titled Advancements in Flux Cored Filled Metals was published in PWL#092, (click on the link to see it in sect. 4). It was followed, in the next issue, [PWL#093 in Sect. 13.1] by the comment of a competent reader who advised that "Once you go beyond carbon steels, a lot of folks shy away from FCAW". That was correct at the time. Maybe that the situation meanwhile improved, and folks feel now more comfortable with FCAW-G. Expulsion Point in resistance Welding, referred to a set of welding conditions, is the amount of welding current (Ampere) above which expulsion is unavoidable. Flanged Lap Joint is very similar to a slip-on flange, the main difference being that it has a curved radius at the bore and face, to house a lap joint stub-end. Lap joint flanges and stub-end assemblies are typically used in situations where frequent dismantling is required for inspection. The lap joint flange itself is not welded or fixed in any way. It is free to spin for proper alignment. Gas Shielded Arc Welding is a group of arc welding processes where continuously streaming shielding gas protects the hot parts from oxidation and contamination. It includes electrogas welding, flux cored arc welding, gas metal arc welding, gas tungsten arc welding and plasma arc welding. Heating Gate is the opening, in a thermite welding mold, through which a heating flame from a gas torch is introduced, to preheat the workpieces. Image Quality Indicators are used to determine the acceptable image quality of a radiograph. They are standard metal pieces of approved thickness and form to be included in any radiograph with the body under examination. The correct appearance of their standard features, wires or holes, in the radiograph, testify to the adequacy of parameters established for taking the picture. Low Temperature Effects, especially those that change dramatically certain mechanical properties like strength and notch toughness, must be considered in the design stage, to account for stability in extreme service conditions. Numerical Simulation of thermo mechanical processes are mathematical methods of analysis of material behavior using the thermal elastic-plastic Finite Element Method and three dimensional solid elements description. Numerical and physical modeling have an important role in materials and thermo-mechanical process development. Numerical modeling popularity has grown with the increasing capabilities of software and computers. New physical simulation technology developments continue to be made in several areas. The longtime Reader and Contributor Tony Rangus sent me immediately, upon reading my introduction to the Guideline, published in the last issue of PWL, the following comments, that I publish entirely hereafter. Concerning the Guidebook to ASME Section IX. Remember, ASME Section IX procedure qualifications only require bend & tensile testing & possibly impact testing if mandated by another ASME Code book section (ASME I, III VIII etc & the B31.X Codes). Thus the PQR tests ONLY show the deposited weld metal is "as-strong" and "as-ductile" and in some instances "as notch tough" as the base material being welded, NOTHING MORE. All fabrication requirements, weld quality etc. are contained in the other Code book sections. In some instances, the other ASME Code book sections modify or add to what is required in ASME Section IX for procedure & performance qualifications. 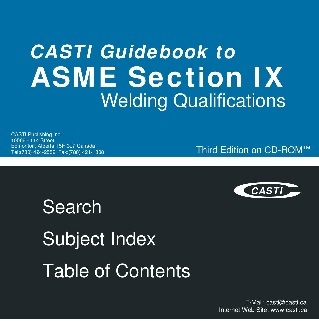 Everyone MUST keep in mind that ASME Section IX is NOT a set of fabrication rules, or "how to guide" on welding. It is STRICTLY for qualifying welding procedures & welders. The revised and updated Pages of this Month refer to mature processes applied successfully for wide different situations. As usual, the correct welding process selection requires an intimate knowledge with advantages and limitations of the processes to find out the main reasons that suggest one instead of possible others. The correct performance requires experience, and is based on development of suitable procedures. The first page is about Electron Beam Welding Tips. It is meant to remind important advice that should be implemented. The second page on Electrochemical Machining describes an important process useful for obtaining irregular shapes by way of metal removal by controlled electrochemical dissolution. Click on	Electrochemical Machining. These days there is much enthusiasm for additive technologies which have many advantages over those that remove metal. Except that not all products that can be planned for these advanced techniques can in fact be realized economically. As always the best solutions will be found with additional advancements of the techniques and with increased experience of practical realizations. To find pages covering other welding related argument, see the Site Map, or type your query in the Search window appearing in almost every page of this website. ... that Surgical Plasma Cutters [Search] are similar, in principle, to your Plasma Cutting Torch? ... the advantages claimed for Fronius CMT Twin tandem welding? Sorry: the link was disconnected. 9.1 - Density absolute, is the mass per unit volume of a material. In practice it is often expressed in weight units divided by volume units, although this quantity is more properly called specific weight. 9.2 - Elastic Strain Energy is the energy expended by the action of external forces in deforming a body elastically. Essentially all the work performed during elastic deformation is stored as elastic energy, and this energy is recovered upon release of the applied force. 9.3 - Flame Straightening is correcting distortion in metal structures by localized heating with a gas flame. 9.4 - Grinding Wheel is a cutting tool of circular shape made of abrasive grains bonded together. 9.6 - IACS International Annealed Copper Standard is a unit of electrical conductivity for metals and alloys relative to an annealed copper conductor standard reference. It is used in reporting electrical conductivity of materials as a percentage of that of the standard. What Role Does Climate Change Play in Tornadoes? The Videos hereafter, that show basic metalworking processes, are instructive and nice to see. It is mind opening for those who have no idea of them, but can be interesting also for experts who may like this easy way to instruct their folks. The last two, show the conference sponsored by a commercial company that develops software for process simulation and a tutorial video on welding simulation. No endorsement is intended but it may be interesting to follow. Watch also the rest of the list. Good morning and thanks very much for taking the time to research the answer to my question of yesterday (16/05/13). Your response is the best I received from all sources I've checked before. This is enough for me to proceed with my project and I'll certainly give you feedback upon successful completion. 13.1 - A kind Reader, Ray Nicholls, suggested to me to "consider a more attractive, colourful, and accessible interface. [...] splashes of colour, columns to break up the page, boxes with information and quick facts, and clickable addresses." I acknowledge this is helpful advice and I thank Ray for it. The problem is that, for me, it would be a lot of work. I will try to do something about, starting from this issue. Tell me please if you think it is worth. 13.2 - Another kind Reader and Contributor, Paul Ipolito, thinks that the information provided by PWL takes too much time to be read and to explore links. He suggested to reduce the frequency of publication, which frankly seems to me slightly overdone... Here is an excerpt from his letter dated Apr 01, 2013. "We have had this discussion previously and I don't think we agreed, but I would consider reducing the amount of content or reduce the frequency of publication. It is so difficult now to find quiet time to read and digest good information. The PWL is always filled with good information. I need more time between issues to make the best use of PWL. I appreciate your efforts and knowledge. Kindest regards." 14.2 - Codes and Standards Conf. July 16, 17. Orlando, Fla.
14.3 - Third VDI Congress, Lightweight Design Strategies in Vehicles. July 3, 4. Wolfsburg, Germany. Sponsored by VDI Wissensforum, Assn. of German Engineers. 14.4 - Visit also, of the same Author, the Home Surveillance Guide Website.